Our literacy apps for the iPad, iPhone, Mac (Squeebles Spelling Test only) and Android platforms help children learn and practise their spellings, punctuation and grammar in an interactive environment where they can learn at their own pace whilst having fun at the same time. Parents & Teachers - set up completely customised spelling tests for your children with the words they need to learn or download one of KeyStageFun's pre-recorded spelling tests. Children - help Gumbo rescue the Squeebles from the Spelling Snake by answering your spellings correctly and earn rewards to use in a fun mini-game called Squeeberang! 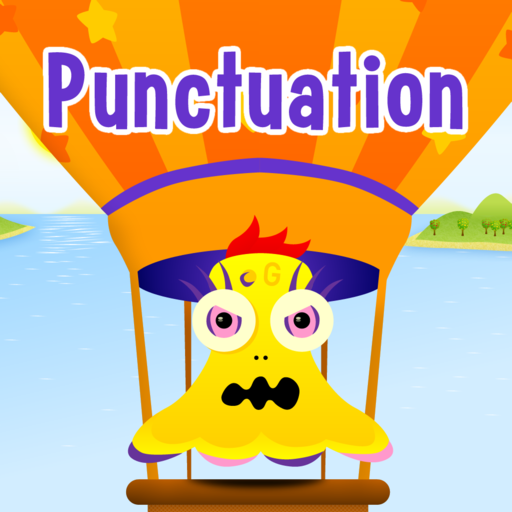 Designed in conjunction with UK teachers and aimed at 5 to 11 year olds, this app features four different game modes across a variety of punctuation topics and difficulties, allowing children to practise their punctuation skills in a fun, interactive way. Features full stops, capital letters, commas, colons, semicolons, speech marks, exclamation marks and questions marks, as well as the difference between its and it's, a section on possessive apostrophes and all UK English contractions. Please note that Squeebles Punctuation is not currently available in the USA or Canada as it is based on UK English punctuation. We intend to release a US / Canadian version by summer 2018. Create completely customised word searches featuring the words your child needs to practise recognising and spelling or choose from 20 preset categories of word search we've created for you. Children can earn turns on a great new mini game featuring the Squeebles' pet, Onion. Squeebles Word Search is available for tablets only. For more information on any of our games, please get in touch. We'd love to hear from you.